Enjoy the Tesla Model 3 Unveil Event video above where Mr. Elon Musk, CEO Tesla explains how entire world is affected by transportation emissions. A study in 2013 from the MIT’s Laboratory For Aviation And The Environment suggested that about 53,000 deaths annually can be attributable to transport emissions alone. After explaining the reason for creating the environment friendly cars the Tesla Model 3 is uncovered for enthusiasts, waiting for the moment for quite some time. The hype has taken the toll on the auto industry and till our last reports the pre-orders on the Model 3 have went up to 392,000 – Woops !!! 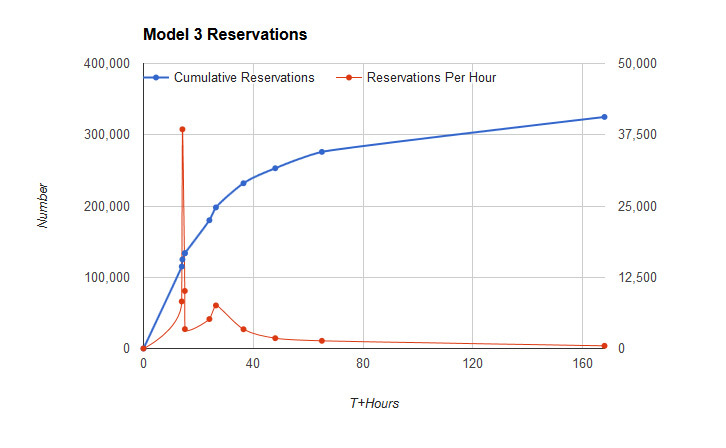 Model 3 Reservations Per Hour. Apr 21, 2016. Click image above for the live / interactive chart.